Evening weddings have a special appeal all their own. After dark, you can really pull out all the stops when it comes to glamor, sophistication, and even entertainment. These are some ideas for spectacular evening wedding themes. If you want your wedding to have an emphasis on fun and glamor, consider a casino theme. Base your wedding design around the sophisticated style of an upscale casino in Monte Carlo or one of the palaces in Las Vegas, all with a bit of retro flair. Crystal chandeliers, gold chargers, and heavy cut crystal glasses are the order of the day. For the bride, a slinky beaded sheath dress with dramatic crystal chandelier earrings would be fabulous, and the bridesmaids can be equally glamorous in satin column dresses with crystal bridesmaid jewelry. Naturally, the high point of the reception will be the gaming; bring in professionals to run games like roulette and blackjack after dinner. Chances are that real gambling for money would be illegal, so let your guests play for chips and pride. Picture a clear ceiling tent under a mass of twinkling stars for your wedding reception. This would create a spectacular place in which to celebrate your wedding. If you cannot conjure up real stars, drape midnight blue fabric over the ceiling of your venue and light it with thousands of tiny twinkling white lights. Play up the star theme in subtle ways throughout your wedding, such as using pierced votive candle holders which have tiny star shapes. A wedding cake painted to resemble Van Gogh's famous "Starry Night" painting would be a real show stopper. This is a particularly fun theme for a wedding on New Year's Eve. Instead of standard wedding favors, give each guest a beautiful handmade mask to wear for dancing after the reception. You can take your inspiration from the lavish masks which are made in Venice, Italy or the flamboyant purple, gold, and green masks which are a huge part of Mardi Gras in New Orleans. The perfect bridal gown for the masquerade theme would be a lavishly embroidered and beaded strapless ballgown, worn with opulent wedding jewelry, and of course, a custom white feather and crystal mask. For the bridesmaids, jewel tone dresses would be fabulous; add crystal bridesmaid jewelry in coordinating colors and vibrant peacock feather masks for dancing. One thing is for sure: you will get some fantastic wedding photos! 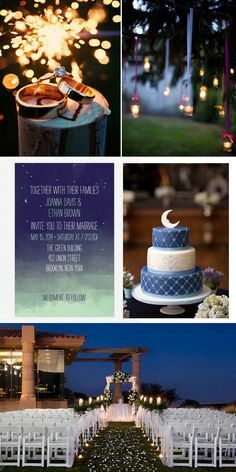 his is a super fun and chic theme for an evening wedding. Instead of a full dinner, invite your guests to a cocktail reception based on the classic cocktail parties which were such a huge part of sophisticated entertaining in the 1950s and 1960s. Serve heavy appetizers along with vintage cocktails like Manhattans and Martinis, as well as a full bar. While your bar bill might be on the high side, you will save huge by having all appetizers instead of a cocktail hour followed by a seated dinner. Play the music of the Rat Pack, break out cocktail shakers, and set up a divine lounge area with rented mid-century furniture. The retro cocktail party is a wedding theme that is sure to be a hit! Let your imagination be your guide and you will find the perfect theme for your evening wedding. Whatever you choose, be sure that it is stylish and sophisticated, and your wedding will be memorable and a lot of fun! Hello. I am the designer of the Starry Night cake pictured above. Could you please give credit to Alpha Delights (alphadelights.com)? Thank you!